After some debate about the first game of the evening Peter finally succeeded in convincing us to agree to T-Rex. Peter had played the game several time before and enjoyed it a lot whereas especially Moritz didn't like it too much on his first try. 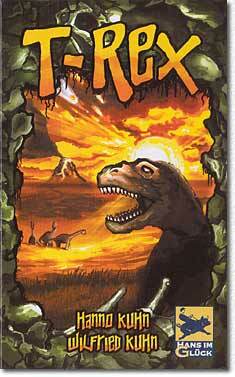 T-Rex is a card game where all players use an identical set of 17 cards and try to win dinosaur eggs. These eggs come in 4 different colors and each egg is worth the total number of eggs a player owns of that color at the end of the game, resulting in a possible exponential growth of victory points. The player cards come in five colors with 3 cards of each color numbered from 1 to 15 plus 2 special cards. Before the first (of a total of 12) round of the game commences each player shuffles his/her deck and draws 7 hand cards to start with. Additionally, 2 dino eggs are revealed from the dino egg draw pile and two color cards are placed on the table to indicate the highest and lowest ranking card color for this round. Players in sequence play one of their hand cards placing it in front of them - there is no need to follow suit. Each card carries a symbol (cards or a comet) which either enables the player to draw additional cards from the draw pile or it signals the beginning of the "end sequence" of that round. When the first comet card has been played the round immediately ends once that player has played another turn and no other player has played a higher ranking comet card. Card ranking goes by the card's color followed by the number on the card. Whoever has the highest ranking card in front of him/her selects one of the two dino eggs; the second egg goes to the player with the second highest card. As a small, but important, bonus the player having the lowest ranking card may replace one of the two color cards that indicate the color rank for the next round. 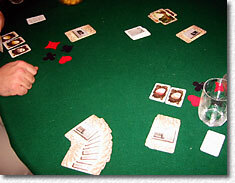 Then each player permanently discards either the top card from his/her draw pile or the card last played in this round. Then the remainder of the cards played this round are placed under the draw pile. The first two or three rounds of T-Rex are usually heavily luck based as it is completely unknown which cards are held by the other players. After a while most players have gone through their draw pile at least once and usually have collected a set of cards that suits their tactics. Especially players with a good memory now have an advantage if they remember which cards are permanently out of the game and which cards or at the bottom of the draw piles. Once a comet card is played in a round this type of information can be vital for winning a dino egg because at that point it is important to be able to judge which player is able to play higher ranking comet cards thereby extending the round. Exact timing is what make winners here as it is important to play the highest ranking card in the last turn of a round and in fact it can be very annoying if a round is extended by another comet card and one has to play another card, which more often than not is a lower ranking card, destroying any hope for winning an egg. For my liking T-Rex rewards good memory too much (old age, I guess). This combined with the usual uncertainties of what tactic another player will apply provides me with too many unpredictability. Interestingly, Moritz, who said he didn't like the game because of the strong memory effect won the game by far and Walter, our Bridge playing card game wizard came in last. 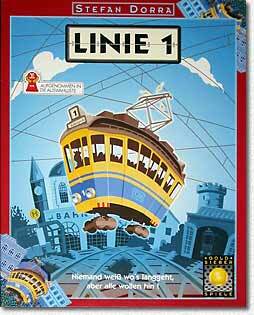 Linie 1 - or Streetcars as the English version published by Mayfair is called - was our second game of the evening. We played this already once a couple of years ago with not too enthusiastic memories and we wanted to give it another try. The task of the (up to five) players is to connect the terminal stops of their streetcar line which are located at opposite borders of the game board by building tracks between them, a principle which was employed already by Twixt may years ago. To make things not too easy players get their streetcar line dealt secretly out of the six available lines and additionally they have to include two (or three in games with less than 4 players) of the many intermediate stops that are placed throughout the board. Also these stops are dealt secretly. The game is played in two phases. During the track building phase a player places two new track tiles anywhere on the board or upgrades already existing tiles. Tiles may only be placed if they legally connect to tiles already placed and can only be upgraded if existing track is maintained. As soon as a track tile is placed next to a stop location a stop sign is placed on that tile. No additional stops are possible at this location. Players therefore are faced with the difficult task of making sure that the stops they must pass are located in such a way that they caneasily be integrated into their own network and on the other hand they must try and avoid revealing their intentions and line identity too early. Line 1 allows all sorts of nasty track laying making it possible to create long detours for other players once one knows their intentions. Even endless loops are possible (see the left terminal of line 4 on the photo) making it impossible to use a piece of track in both directions. The second phase of the game begins once a player has completed the required route. 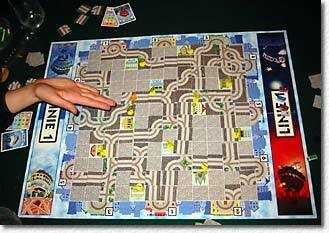 The player announces this to the other players and indicates the route on the board. The rules state that this must be done so that all players are able to verify that a valid route exists. And in fact, it happened twice during our game that a player announced a valid route which in fact did not exist! Once the route has been verified the player starts travelling with a streetcar starting at one terminal, along the two (three) intermediate stops to the terminal at the opposite side of the board. The "motor" of the streetcar is a die with numbers 1 to 4 and two "H" signs. The player rolls the die once per turn and moves the streetcar the number of track tiles indicated on the die or to the next stop if an "H" has been rolled. Here it becomes obvious why a short route is so important. While some players have already started their streetcar other players may still be building their route. The point in time when to start the streetcar needs to be carefully judged because sometimes it can pay to optimize a route further rather than starting the car on a hopelessly long route. Moritz came in first closely followed by Walter, who in fact had the shortest route of all players. My chances of winning came to an abrupt end when Andrea ("unintentionally", as she said, believe it or not) blocked my intended starting location by a loop construction. Line 1 in my opinion is a strange mixture of a game: on the one hand there is the rather complex track building race amongst the players followed by a dice rolling war in the second phase. My feeling is that the players who like the track building will not be too happy with the second phase and vice versa. This evening we had sufficient time left to try some experiments with our usual final game of the evening: Bluff. After Moritz had won the first game of Bluff (making this a very good evening for him) we decided to change player position at the table to find out if that has any influence on the game results. Doing so we managed to achieve a clear win for each player - a result we never had before. Which leaves us with the question: does the seating order really have in influence on the Bluff results? If so, what exactly is the cause of this influence?